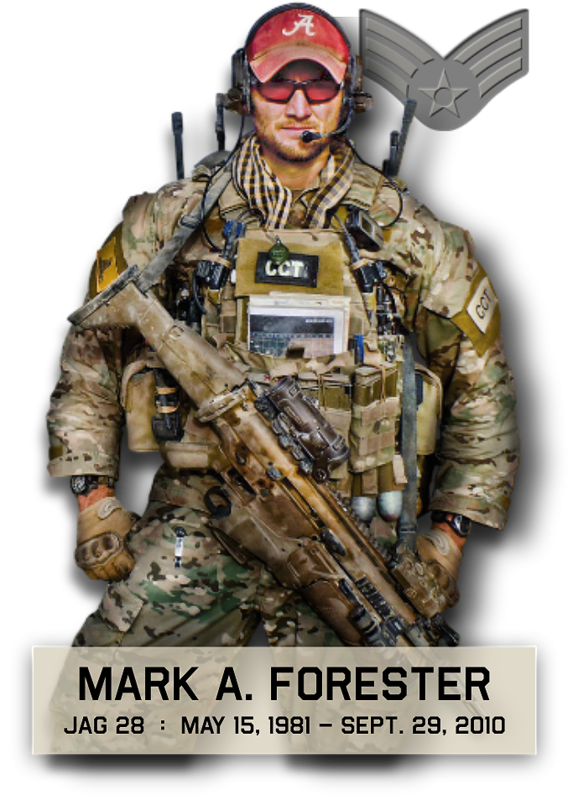 Marc is a Combat Controller who was severely injured in May 2009 from an IED in Afghanistan. The reason we are familiar with him is Mark’s sister-in-law, Rozlynn, met him at Walter Reed while visiting George Earhart in November. She said Marc was there to offer support to George and Ray, who were both injured in Afghanistan this past fall. Marc told me that one thing he’s trying to do is successfully improve the lives of those like him, who become injured. Click here to read about Marc’s accident, recovery, and mental toughness. He is very fortunate to be alive, and to have his legs. When the medic got to him, he was on fire, had broken bones in his legs, broken back, and multiple other injuries. In May 2010, Marc competed in the Warrior Games in Colorado Springs. He said he walked away with a few medals, but most importantly enjoyed the competition between the “disabled” folks. We look forward to meeting Marc one day. He was at Mark’s memorial service at Pope, but as far as I know, we did not meet.. Marc’s story is exactly what Mark Forester’s web site is about. Marc’s example is great motivation for anyone to overcome trials, and do something to benefit others. Below are two links that offer more insight into what Marc participated in last year for wounded warriors and to raise money for the Special Operations Warrior Foundation. They biked from San Francisco to Virginia Beach over the span of 64 days. Very good web sites with video.